Bengaluru FC scored twice on either side of the break to beat ATK by two goals and consolidate their position atop the league table. This was ATK’s third consecutive home defeat which means that their chances of making it to one of the semi-final spots is effectively over. Here are the takeaways from the game at the Vivekananda Yuva Bharati Krirangan. Bengaluru FC set up in their familiar 4-2-3-1 with Chhetri deployed just behind the striker, Miku, in a free role flanked by Edu Garcia and Udanta. The familiar pairing of Juanan and John Johnson started in the heart of defence while Erik Paartalu and Lenny Rodrigues played the double pivot. The key to Bengaluru’s success this season has been the fluidity and understanding between their frontmen. Over the course of the season, the trio of Edu, Chhetri and Miku have developed an almost telepathic understanding. Although Chhetri technically started as a number 10, there were occasions when he went beyond the number 9 and Miku dropped in to the hole linking the midfield to the attack. Udanta mainly operated on the right, giving ATK left back, former Bengaluru FC man Keegan Pereira a torrid time due to his electric pace. Edu Garcia meanwhile, often came in-field allowing young Subhasish Bose plenty of space to overlap whenever he so wished. The most important aspect of Bengaluru’s game was the tireless running of Lenny. He is very vital to Roca’s quick passing game as he links the two ends of the Bengaluru team and is often tasked with carrying the ball forward, something he did with consummate ease on the night helping Bengaluru chalk up their 9th win of the campaign. While Bengaluru FC has benefitted from stability this season, ATK has suffered from the lack of the same. On the night, the home side made 3 changes to their starting line-up from the previous game while also altering their shape to a 4-3-3. In the absence of the injured Tom Thorpe, the pair of Conor Thomas and Jordi Montel retained their place in central defence. Ryan Taylor started in the middle of Rupert Nongrum and Darren Caldeira in midfield while Martin Patterson spearheaded the attack with inverted wingers Jayesh Rane and Bipin Singh. The basic difference between Bengaluru FC and ATK in the game was the understanding between their players. Fielding different personnel and being forced to tinker with key partnerships across the pitch has led to poor communication resulting in misplaced passes. This was Ryan Taylor’s first game with Caldeira and it showed as the latter, one of the free 8s, was largely invisible throughout the game. ATK’s tactics was quite clear till Robbie Keane came on. They basically overloaded one side of the midfield in their own half and then looked for the long diagonal to the other flank. This overloading mostly happened on the left as Taylor majorly played with Rupert and not Caldeira, so Ashutosh found a lot of joy overlapping down the right. Whenever he got the delivery right, ATK managed to cause trouble in the Bengaluru defence. Once Keane replaced Rupert, ATK matched Bengaluru’s formation with Keane playing as a number 10 and the home side started looking very threatening. Keane was instrumental in linking up the midfield to the attack. His passing range and movement threatened to level the game up before Miku scored late to seal the three points for the away side. Bengaluru FC seemed to pay homage to the adage that says something on the lines of “champions know how to get results even when they are not playing well”. Bengaluru came into the game knowing fully well that ATK is not the same side that has won two of the three ISLs thus far and they played just about well enough to walk away with the three points. The away side got off to the best possible when they found themselves ahead within three minutes from kick-off through a world-class own goal from ATK skipper, Jordi Montel. The move started when Conor Thomas’ pass was intercepted by Paartalu following which Edu Garcia played Udanta through. Udanta beat Keegan for pace and played an innocuous ball intending to find Miku in the box. Jordi looking to clear a ball he overran, connected brilliantly with his right foot and the ball curled beyond a helpless Debjit and into the net. Bengaluru FC’s primary motive coming into the game would have been to get maximum points without having to exert too much especially with a tight schedule facing them in the coming week and this start served them perfectly. The away side dropped their intensity, started back and hardly pressed ATK who have been largely uninspiring in possession. The fact that Bengaluru had central defenders much taller than ATK’s strikers helped them deal with the crosses from the home side with ease. 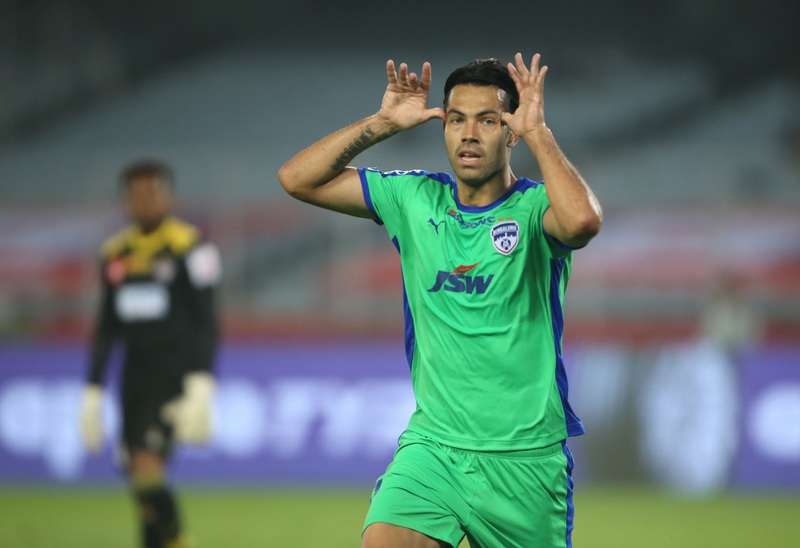 In the second half, things got a little tricky for Bengaluru for a brief period when Rahul Bheke, who made two stunning goal-saving interceptions in the 6-yard box, got himself sent off. But like every good side, Bengaluru FC made sure they killed off the game on the counter when Miku scored the insurance goal in the 83rd minute after goalkeeper Gurpreet made a couple of decent saves to deny ATK the equaliser. Despite suffering a 0-2 reversal, ATK’s performance was much better than their previous game where they lost by half the margin. The home side benefitted from Taylor’s return to the team which meant they could field a natural defensive midfielder instead of a winger in that position. They were also helped by Bengaluru’s lack of attacking intent for most of the game. But some poor crossing and erratic finishing meant that they got nothing out of the game. As stated earlier, ATK switched the ball wide and looked to deliver crosses into the box to find a way to score and thus break their two-game losing streak. Unfortunately, though, for a team that depends so heavily on crosses into the box, they have been horrific in that very department this season. In the first half of this game itself, ATK right back Ashutosh Mehta found himself in considerable space with ample time to find his target in the box as many as six times. But on each occasion, he was unable to pick out a red and white shirt, either overhitting the ball or failing to clear the first defender. In fact, the closest ATK came to equalising was in the 33rd minute when Bipin found Jayesh Rane in the box whose header, unluckily for ATK, rebounded off the post and was then heroically cleared by Bheke. In the second half, yet again it was a Bipin cross intended for Rane that almost got ATK the equaliser but again, almost off the goal line, Bheke saved the day. Once Keane came on, ATK adopted a more central approach and it would have paid off too had the man himself and Patterson been a little more clinical. While the pair combined to force Gurpreet into a couple of good saves, they should really have found the back of the net. While Keane cut in from the left, Patterson did so from the right and on both occasions, the Irishmen were guilty of not being clinical after having created the perfect angle to score. Despite the misses, ATK were coming closer to a goal when, almost on cue, Caldeira walked off injured. Within three minutes of that, Bengaluru found their second goal from a fantastic solo run by Miku on the break, effectively finishing off the contest. With this defeat, ATK surrender their slim mathematical possibility of making it to the top 4 and thus relinquish their proud record of being the only club to have made it to the semi-final of every edition of the ISL, till season 3.